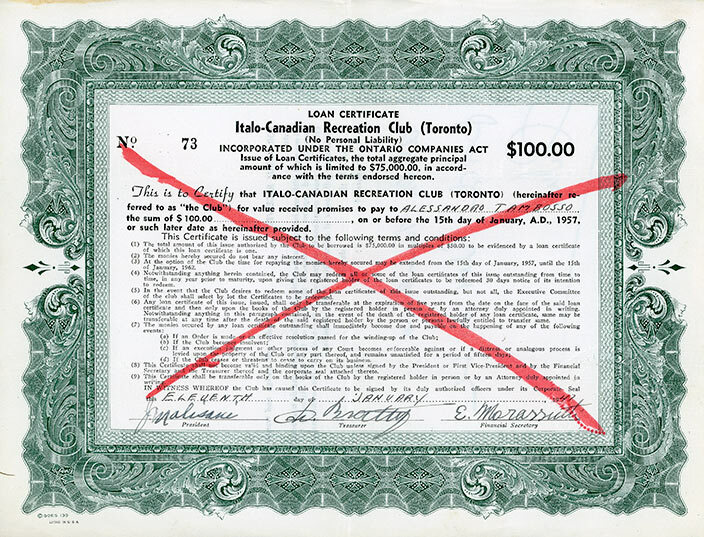 Loan certificate for the Italian Canadian Recreation Club, issued to Alessandro Tambosso, January 11, 1947, valued at $100. The certificate is signed by the executive officers of the club, P. Malisani, D. Bratty, and E. Marrasutti. These certificates were paid out and cancelled after a certain period of time (January 15, 1957 - January 15, 1962). Their cancellation is often indicated by a red X across the face, and notes with signatures on the back. This certificate seems to have been paid out to Tambosso on November 30, 1961. It appears Tambosso contributed $200 in total, and was issued two certificates. After the war, some communities began to rebuild their organizations. In Toronto, the Italian Canadian community fought for the return of the Casa d'Italia building. At the same time, in 1947, with several hundred members, the Italo Canadian Recreation Club (ICRC) was built on Brandon Ave. The ICRC became a focal point for the post-war community -- the location for dances, social events, meetings and weddings. Among the early supporters was former internee Alessandro Tambosso. ICRC supporters would also include many who later became involved with Villa Charities Inc.